China’s space agency has released panoramic photographs taken on the lunar surface by the country’s Chang’e 4 probe – the first manmade craft to land on the mysterious far side of the Moon. The stunning 360-degree panoramic photos, taken by a camera mounted on the top of the lunar lander, were relayed to the China National Space Administration (CNSA) on Thursday. The photos reveal a seemingly endless horizon of grey, rocky terrain. 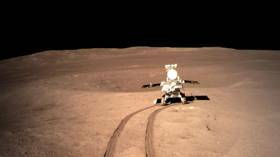 Several photos show the lunar rover Yutu-2 driving into the distance. Chang’e 4 touched down on the Von Karman Crater in the South Pole-Aitken Basin in the morning of January 3. The probe’s first image of the lunar surface was beamed back to Earth later that night.